Written by Amanda Martin, Southeast Asia Unearthed trip leader. We rolled into Cambodia’s bustling capital city, Phnom Penh, when the days to the upcoming Cambodian election could be counted on one hand. For the first time in decades, a mobilized population and a strong opposition were finally challenging Cambodia’s Prime Minister, Hun Sen. In power for over 28 years, Hun Sen’s monopoly over his country’s economy and government is extremely controversial amongst the international community and his own people. While many Cambodians are happy with the growth of the economy and general stability after their recent civil war and genocide a mere 30 years ago, there is discontent growing and many Cambodians are beginning to stand up and demand change! Our crew spent the first few weeks in Cambodia soaking up rural life and learning about the challenges faced by the ever-present land grabbing, water shortages, and poverty. The challenges are many, but there is still a resounding sense of happiness and calm amongst these resilient people. As we entered urban life, we could sense the enthusiasm and energy for change. There were parades of hundreds of painted faces on motos waving Cambodian flags and cheering “Change or No Change!” as they drove by their fellow citizens. “Change!” They would chant back as they would proudly raise seven fingers in the air symbolizing their vote for the Cambodia National Rescue Party (CNRP). 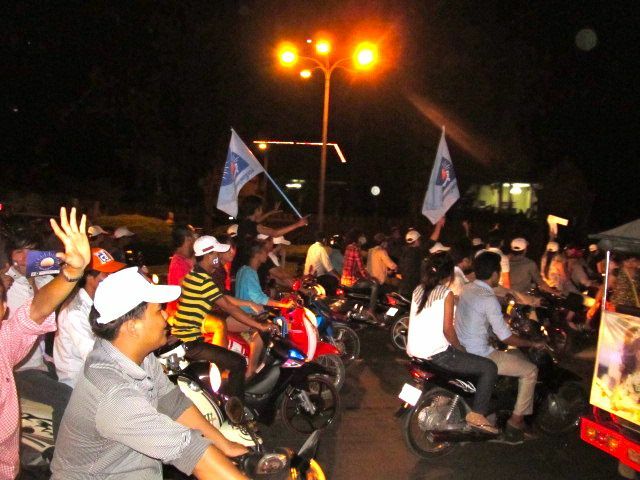 The Cambodian People’s Party (CPP), Hun Sen’s ruling party, were also out on the streets in full swing. Throwing parties in the streets with massive stages and monetary presence, their supporters undoubtedly exist as well. In order to understand the challenges facing Cambodians today, it was important for us to delve into their tragic and recent history. During the Vietnam War, Cambodia was a neutral player but fell into a civil war between the communist Khmer Rouge and the pro-American government of Lon Nol. In 1975 as the war ended in neighboring Vietnam, the Khmer Rouge, under the lead of the infamous Pol Pot, took control of the country plunging the entire nation into a time of fear and despair. Over a third of the country died in as little as three years. They were overworked, starved, tortured and murdered as the Khmer Rouge strived to bring the country back to the “Year Zero”. The educated were targeted and people were herded into the countryside in hopes of creating an agrarian utopia. This dream failed. We visited a mass gravesite at Cheung Ek, better known as the Killing Fields: a somber reminder of the countless lives lost at the hand of the Khmer Rouge. A majestic monument homes the thousands of skulls and bones found in the aftermath. After the history lesson, we moved on to the S21 Prison. With blood on the ground and rows of photographs of victims ranging from the ages of 4 and up, their vacant, defiant and/or defeated gazes continue to haunt our memories. While a saddening and sobering experience, it is always essential to visit these historical nightmares so we may learn from our collective mistakes. In what direction Cambodia will take after these elections, only time will tell. Our crew is simply humbled to have been able to witness a historic moment!